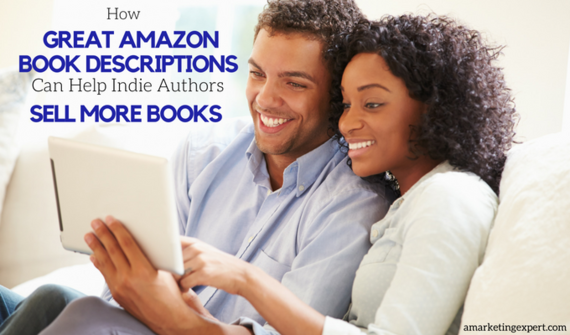 Whether on Amazon or any other e-tailer, book descriptions are more important than most authors realize. Many times I'll see blocks of text pulled from the back of the book and while, in theory, that's not a bad idea. It may not be the greatest if your book description isn't strong to begin with or if the book details are just slapped up on Amazon (or Barnes & Noble, etc.) without an eye to things like spacing, bulleting, bolding, etc. 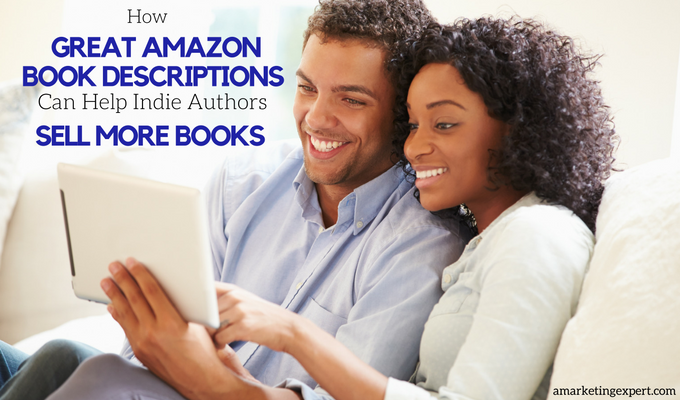 Within this piece, I'm going to share some ideas about book descriptions specifically and then some tips you may want to consider in order to enhance your own book description for the maximum punch on Amazon. Most people don't read websites, they scan. So the same is true for your book description. If you have huge blocks of text without any consideration for spacing, bolding, bullets or some other form of highlighting that helps the reader scan. It's also much more visually appealing and, psychologically it invites the reader to delve in, instead of click off. Our minds are image processors, not text processors so huge pieces of text that fill a page overwhelm the mind and in fact, slow down the processing time considerably. When you're looking at websites, our attention span is even shorter than it is while reading a book. Even sites like Amazon where consumers go to buy and often spend a lot of time comparing products and reading reviews - it's important to keep in mind that most potential readers will move on if your text is too cumbersome. Headlines: the first sentence in the description should be a grabber, so something that really pulls the reader in. This text could also be a stunning blurb or some other kind of endorsement but regardless, it should be bolded. If you're looking at your Amazon book page, you could also use the "Amazon Orange" to set it apart from the rest of the text. Bolding: You can bold key text throughout the description, in fact I recommend it. Just be sure you aren't bolding too much - so don't grab 2-3 sentences to bold, because it'll have more impact if you just do one or just a few keywords. Bullets: If your book is non-fiction, it's not a bad idea to bullet your information as much as you can. Take key points and the "here's what you'll learn" elements and put them into a bullet point section that's easy to scan and visually appealing. So, how do you update the text styles within your book description? There are several types of code you can use to enhance your headline and description. Keep in mind that you can't make these changes to your headline using Author Central; it all has to be done from the dashboard. Though this won't affect your algorithm, per se, it will help make your book description more visually appealing. The biggest challenge authors face is writing a book description that really highlights its benefits for readers. This matters whether it's fiction or non-fiction and it's a critical part of any book description. Remember with 4,500 books published every day in this country, you can't afford to have some vague book description, you must state clearly why this book is the best one they can buy. That does, however, lead me to the differences between fiction and non-fiction when it comes to book descriptions. Non-Fiction: First off, it's probably very likely that whoever you are targeting already has 10 or more titles similar to the one you just wrote. So why on early should they add yours to their collection as well? As you're powering through your book description, keep in mind that you're likely serving a very cluttered market and you'll need to be painfully clear about why your book matters. You should hook the reader from the first sentence and remember to make a personal connection with the reader via the book description. So what if you have a massively strong bio that helps carry the topic of the book in some substantial way? Let's say that you lead research on XYZ topic, then that should be factored into your book description. Keep it brief though, because you'll have a chance to elaborate on it later. Fiction: Fiction is a bit tougher because the tendency is to reveal too much of the story. Instead, I encourage you to focus on the elevator pitch because that's going to be your cliffhanger, or your key interest point in the book, and every other piece of the story anchors to that. When it comes to fiction buyers have a lot of options so be clear on what your book is about and lead with the hook. Children's and/or Young Adult Titles: Specifically for these books, make sure to include the intended age range. Even though you can add it in the Amazon details, I've had parents tell me that seeing it in the book description is incredibly helpful. So what is an elevator pitch and why do you need one? An elevator pitch is a short one- to two-sentence description about the book. It's the briefest of the briefest descriptions you can develop. The reason elevator pitches are important is that we have an ever- shrinking attention span, so you need to capture someone's attention in a very short, succinct pitch. So why does this matter for your book description? Well having a short blurb is an excellent way to start building your book description. Also, elevator pitches focus on the core of your book - the one element that your book could not be without - and that will be the biggest piece that matters to your reader. When it comes to writing a book description, I encourage you to save your five-dollar words for another time. Book descriptions that work well, tend to use simple language that any layperson can understand. If you make someone think about a word, you'll lose them and the effectiveness of your book description will go right out the window. Have you ever seen a book description with a ton of exclamation points or caps? Much like in email, it feels like someone is screaming at you. Though I don't dislike exclamation points entirely for a book description, they should be used sparingly. I'd recommend one or two at most. Studies have shown that an exclamation point used here and there can help make a sentence seem even more authentic. In terms of caps, don't even bother. Caps in a book description makes you look like an amateur. It goes without saying and still I've seen it enough that I feel like I need to say it. Please don't put up a book description full of typos, even one is too many. If your book is a series, make sure and tell readers that it is, and add that right to the headline. I also recommend that you make it part of the title, too. So, for example, you might word your book title like this: Deadly Heat: Heat Series Book 4 of 7 . The term "keyword" is actually inaccurate because readers don't search based on a single keyword. Think instead of keyword strings. So, for example, romance about second chances has been a popular search string on Amazon for a while now. However, by taking that sentence and inserting it into your book description, you can really help boost your visibility on the site as well as keying into your readers' direct interest. So if they're searching for romance second chances, and they see it in the book description, it's going to ping them with: "Oh! This is the exact book I've been looking for." 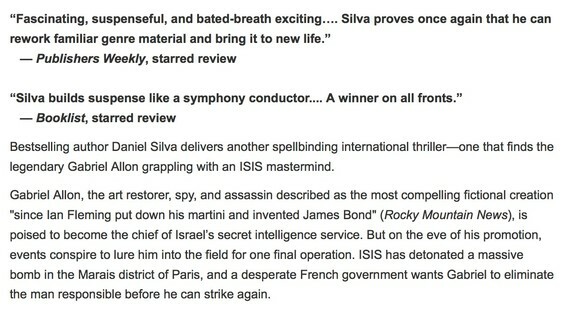 That said, it's a good idea to avoid over-stuffing your book description with keywords. I recommend finding six or seven strings and using them sparing throughout. I often tell authors that no one cares that you wrote a book. And while family and friends may care, they aren't your intended audience. If you want to pull in readers - a lot of them - make sure that your book appeals to their needs and their interests, not yours. This is partially why I never recommend that authors write their own book descriptions. I often hire someone to do this for me because I'm just too close to it to see what may really matter to my reader. One of the things that I see a lot is author bio information that really has nothing to do with the book. So, for example, let's say you wrote a book about marriage but your bio talks about how you live in Maine with your wife and three dogs. That doesn't really help substantiate your expertise for writing this book. The same is true for fiction actually. If you have multiple books, mention that - if you have a fun or quirky writing habit, mention that, too. It's a good idea to personalize this to your audience and the market. List any credentials as they may matter to the book topic and/or any research you've done. Most of all, make it interesting and keep it short. Long, boring author bios don't sell books. So often I see quotes such as: "This is the best mystery book I've read in ages!" but "who" actually said it is left out. Reviews and quotes/blurbs are fantastic to use in your book description but only if they are cited appropriately. Several authors told me that they often don't cite them because they feel their name won't lend the kind of credibility that they want from the blurb. So for example, a quote from someone at work, or a neighbor, etc. In this case, why not just ask them to review the book instead. 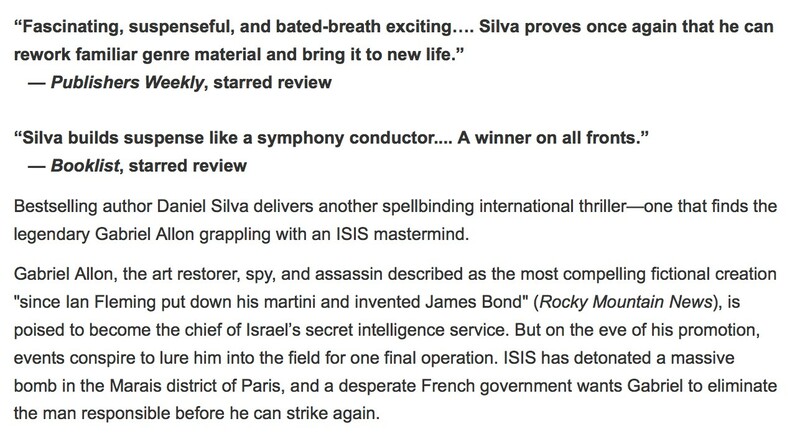 Finally, take a look at this book description from Dan Silva - it's a great example of a book that combines great blurbs with a book description that pulls you in from the first sentence. Book blurbs are eye candy i.e. people like what other people like. Even if you don't have blurbs by highly recognizable names such as Booklist and Publishers Weekly, you should still add them (just be sure to cite them correctly). Notice how they are bolded to draw attention to them? And check out the second paragraph, whoever wrote this book description inserted a review to help bolster the character description, which is another great idea. Your book description whether on Amazon, iTunes, or Barnes & Noble - is your sales page and the ultimate book marketing tool. Book descriptions are what will, or won't, help sell your book, so make sure it's tightly written, exceptionally engaging, and most of all, turns a browse into a buy.